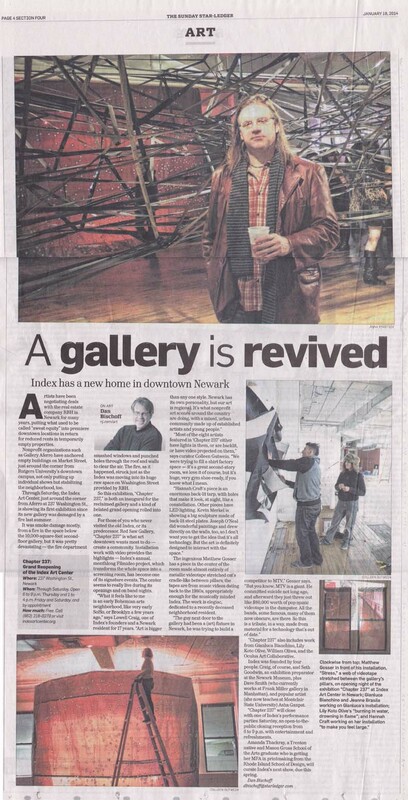 On Sunday Jan 19, 2014 Dan Bischoff of the Star Ledger released this article about the new Index Art Center space at 237 Washington St in Newark, NJ and the exhibition I curated for the opening titled Chapter 237. The installation artists for the is exhibition included: Gianluca Bianchino, Lily Koto Olive, Joseph O’Neal, Matthew Gosser, Kevin Merkel, William Oliwa, Hannah Craft, & Oculus Art Collaborative. This entry was posted in curatorial, current events, Press on January 21, 2014 by Colleen Gutwein.